Amazon raised its minimum wage for US workers to $15 per hour. Then, it took a bunch of other benefits away in what's being called a "stealth tax." Previous to the announced increase in minimum wage to $15/hr., warehouse workers were eligible for production bonuses and stock awards. Those will be terminated when the wage is increased. Amazon claims it's a net gain for the workers, but others disagree. CEO Jeff Bezos still makes $30,000 a minute. Net positive, or not so much? Following the announcement earlier this week of Amazon increasing wages to $15/hr., the company today told its warehouse workers that production bonuses and stock awards are no longer on the table. "The significant increase in hourly cash wages more than compensates for the phase out of incentive pay and [restrictive stock units]," Amazon's spokesperson said in an emailed statement to CNBC. "We can confirm that all hourly Operations and Customer Service employees will see an increase in their total compensation as a result of this announcement. In addition, because it's no longer incentive-based, the compensation will be more immediate and predictable." The net effect will be a reduction for some, especially those who have been with the company the longest; warehouse workers had received effectively one share every year after having been with the company for a number of years. That would currently be worth nearly $2,000, and they received an additional extra share every five years as well. Also, production bonuses added up to as much as $3,000 a year for some. Based on a 40-hour workweek, that's a net loss of $2.40/hr. for those who were able to receive both of those bonuses. In other words, for those already making over $12.50/hr. plus stock and production bonuses, it takes money away. The news comes on the heels of praise from all over the place for the initial wage increase, including Senator Bernie Sanders, a long time critic of companies with employees forced to receive welfare and Medicaid because of such low wages. Workers in an Amazon warehouse. At a time when CEO Jeff Bezos makes more every minute—nearly $30,000—than many Amazon employees do in total, it's an interesting move, and one that might test the loyalty of some long-time employees. When Amazon announced their wage increases yesterday they said nothing about cutting staff benefits. So, what say you? Is this a "Robbing Peter to pay Paul" move after a much-awaited pay raise, or is it a legitimate business decision based on dollars and sense? 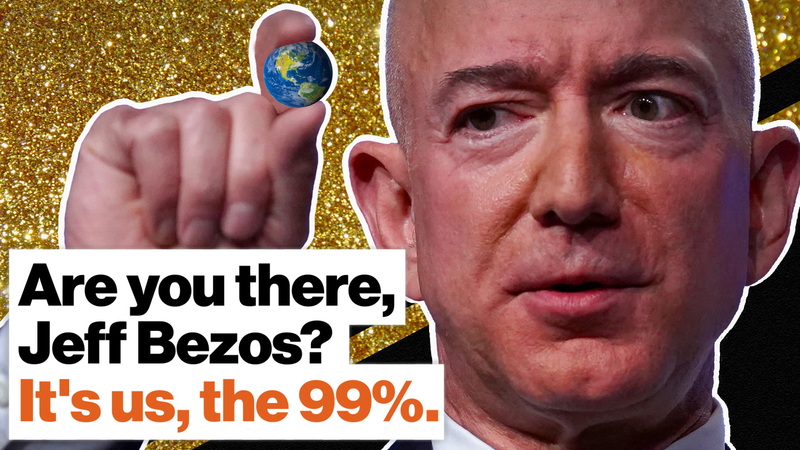 Are you there, Jeff Bezos? It's us, the 99%.